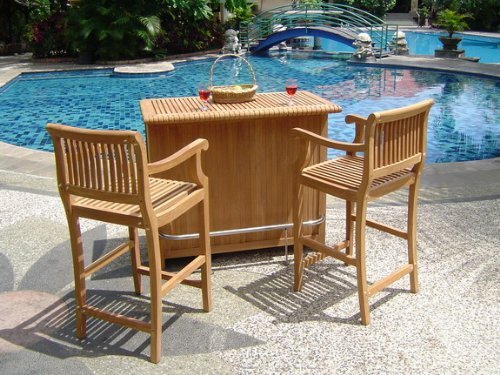 Our teak Captain's chairs feature a bar-high seat with a foot rest for comfort. High-quality, water repellant TEXTILENE seat fabric and smooth teak construction make these chairs a comfortable seating solution. Folds easily for storage. Features stainless steel hardware. Seat and back are available in blue or white. By itself or paired with one of our bar height tables, this tall chair adds contemporary style to any outdoor entertainment area. POLYWOOD furniture is constructed of solid POLYWOOD recycled lumber that’s available in a variety of attractive, fade-resistant colors. It won’t splinter, crack, chip, peel or rot and it never needs to be painted, stained or waterproofed. It’s also designed to withstand nature’s elements as well as to resist stains, corrosive substances, insects, fungi, salt spray and other environmental stresses. Best of all, POLYWOOD furniture is made in the USA and backed by a 20-year warranty. 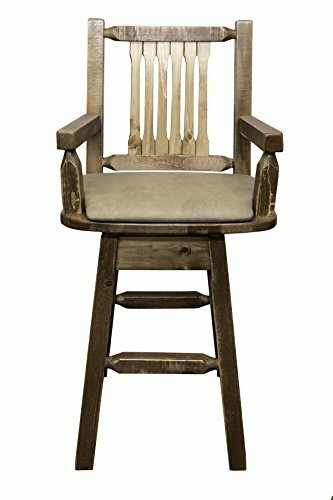 Featuring an oversized swivel seat with fixed back, this unique Captain's Barstool with arms is hand crafted using genuine lodge pole pine and the mortise and tenon joinery system for rugged durability and great looks. his Homestead Collection Captain's Barstool features square sawn timbers for a barn wood or timber frame appearance. This item comes professionally finished with multiple coats of premium grade stain and a semi-gloss clear lacquer. This model features an upholstered seat in the Buckskin pattern. Seat height: 30". Seat width: 19" Capacity 350 pounds. All Montana Woodworks products come with a 20-year limited manufacturer's warranty at no additional charge. Hand Crafted in Montana U.S.A. 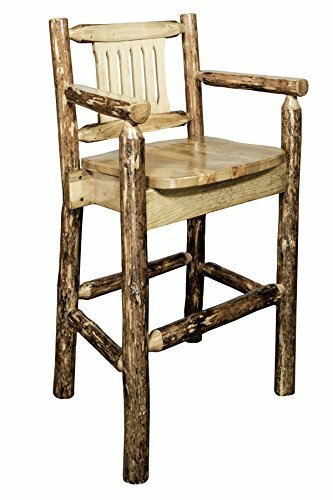 This unique Captain's style barstool features solid, genuine lodge pole pine construction and is created using the tried and true mortise and tenon joinery system for true heirloom quality and rugged durability. To achieve the famous Glacier Collection appearance, the artisan's at Montana Woodworks use an old fashioned draw knife to carefully remove all the outer bark on the logs while leaving as much of the inner bark or cambium layer as possible. The unique "bark on" appearance creates an increased texture and contrast unique to this collection. This item comes professionally finished in the one-of-a-kind Glacier Country Collection style with multiple coats of premium grade stain and a semi-gloss clear lacquer. This model features an upholstered seat in the Wildlife pattern. Seat height: 30". Seat width: 18.5" Capacity 350 pounds. All Montana Woodworks products come with a 20-year limited manufacturer's warranty at no additional charge. Hand Crafted in Montana U.S.A. 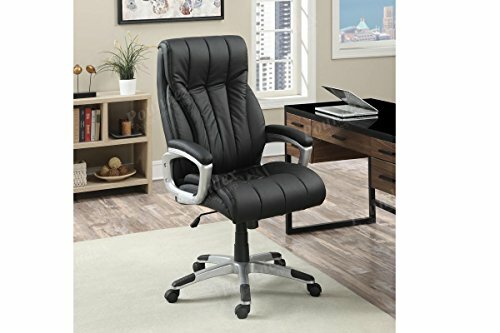 Sit in an office chair with plush seating and back support in black faux leather with a silver accents. It includes adjustable seating and wheels for mobility. Available in two backrest heights. Experience all the charms of rustic furniture without the "log' look. Master craftsmen square saw the raw timbers to replicate the look once found only in the best homes of the early American frontier. 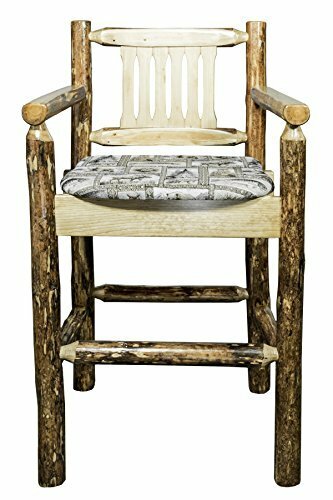 Features the standard ergonomically designed seat and back Montana Woodworks has become famous for. Comes fully assembled. Seat height is 30". Capacity 350 pounds. 20-year limited warranty from manufacturer included. Made in the USA by Montana Woodworks, a One Good World verified Eco-Friendly company. 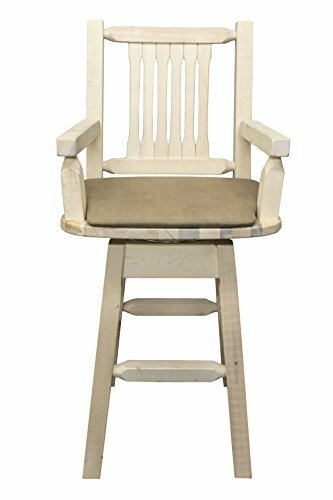 This unique Captain's style barstool features solid, genuine lodge pole pine construction and is created using the tried and true mortise and tenon joinery system for true heirloom quality and rugged durability. 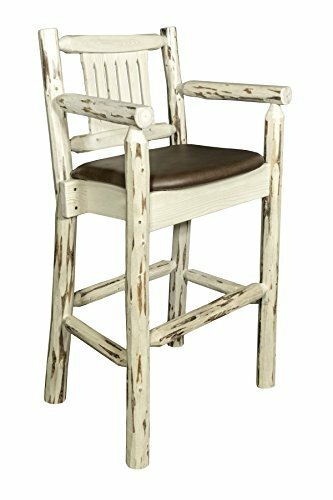 This Montana Collection Captain's Barstool is skip peeled by hand using old fashioned draw knives for a unique, one of a kind appearance. This item comes 'ready to finish' i.e., it is ready to be lacquered or stained and lacquered to match your homes existing decor. This model features an upholstered seat in the Saddle pattern. Seat height: 30". Seat width: 18.5" Capacity 350 pounds. All Montana Woodworks products come with a 20-year limited manufacturer's warranty at no additional charge. Hand Crafted in Montana U.S.A. 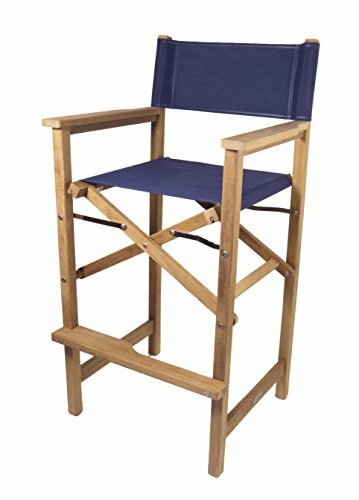 Featuring an oversized swivel seat with fixed back, this unique Captain's Barstool with arms is hand crafted using genuine lodge pole pine and the mortise and tenon joinery system for rugged durability and great looks. his Homestead Collection Captain's Barstool features square sawn timbers for a barn wood or timber frame appearance. This item comes 'ready to finish' i.e., it is ready to be lacquered or stained and lacquered to match your homes existing decor. This model features an upholstered seat in the Buckskin pattern. Seat height: 30". Seat width: 19" Capacity 350 pounds. All Montana Woodworks products come with a 20-year limited manufacturer's warranty at no additional charge. Hand Crafted in Montana U.S.A. 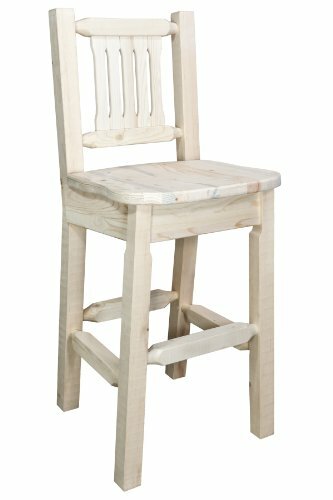 This unique Captain's style barstool features solid, genuine lodge pole pine construction and is created using the tried and true mortise and tenon joinery system for true heirloom quality and rugged durability. To achieve the famous Glacier Collection appearance, the artisan's at Montana Woodworks use an old fashioned draw knife to carefully remove all the outer bark on the logs while leaving as much of the inner bark or cambium layer as possible. The unique "bark on" appearance creates an increased texture and contrast unique to this collection. This item comes professionally finished in the one-of-a-kind Glacier Country Collection style with multiple coats of premium grade stain and a semi-gloss clear lacquer. This model features the standard ergonomic wooden seat. Seat height: 30". Seat width: 18.5" Capacity 350 pounds. All Montana Woodworks products come with a 20-year limited manufacturer's warranty at no additional charge. Hand Crafted in Montana U.S.A. 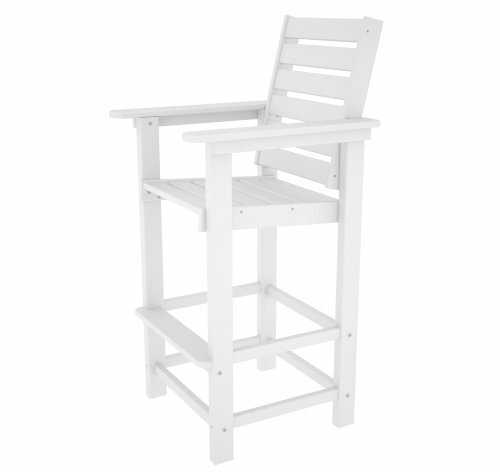 Compare prices on 30 Inch Captains Stool at ShopPlanetUp.com – use promo codes and coupons for best offers and deals. We work hard to get you amazing deals and collect all available offers online and represent it in one place for the customers. Now our visitors can leverage benefits of big brands and heavy discounts available for that day and for famous brands.